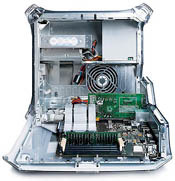 Announced in September 1999, alongside the PowerMac G4 (PCI Graphics), the PowerMac G4 (AGP Graphics) was a major revision of the PowerMac line. Based on the Unified Motherboard Architecture, The G4 AGP was built around the MPC 7400 chip, which was dramatically faster than its predecessor, the PPC 750 (for a more detailed description of the 7400, click here.). The G4 AGP introduced a number of performance improvements, including AGP-based graphics, AirPort compatibility, a faster memory bus, DVD-ROM or RAM standard, an internal FireWire port, 2 separate USB buses for a combined 24 Mbs, a 2X (133 MHz) AGP slot, and up to 1.5 GB of RAM. The G4 AGP also introduced the new professional color, "graphite." 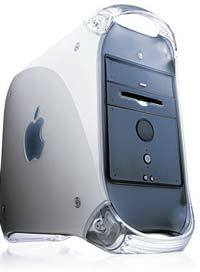 The G4 AGP started at $2499 for the 450 MHz configuration with a 20 GB hard drive and 128 MB of RAM, and $3499 for the 500 MHz configuration with a 27 GB hard drive and 256 MB or RAM (both included internal Zip drives). There were extreme supply issues with the G4 initially, due largely to Motorola's inability to deliver the 7400 chips in adequate supply. This was further compounded by an "errata" in the initial revision of the 7400 that effectively lowered the ceiling of the chip to 450 MHz. As a result, all models of the G4 were "speed dumped" in October. The $2499 450 MHz model was lowered in speed to 400 MHz, and the $3499 500 MHz model was lowered to 450 MHz. The price, and all other specs were the same. Not a single first-run G4/500 shipped, and very few $2499 G4/450s ever made it to the channel. Orders placed before the speed reduction were honored, with the exception of the 500 MHz orders, which were filled with 450 MHz models with more Memory. A 350 MHz configuration was subsiquently added to replace the similar G4 (PCI Graphics) configuration a month later, and the whole line was speed-bumped back up to 400/450/500 in February 2000.